We present a generic approach to readable formal proof documents, called Intelligible semi-automated reasoning (Isar). It addresses the major problem of existing interactive theorem proving systems that there is no appropriate notion of proof available that is suitable for human communication, or even just maintenance. Isar’s main aspect is its formal language for natural deduction proofs, which sets out to bridge the semantic gap between internal notions of proof given by state-of-the-art interactive theorem proving systems and an appropriate level of abstraction for user-level work. The Isar language is both human readable and machine-checkable, by virtue of the Isar/VM interpreter. 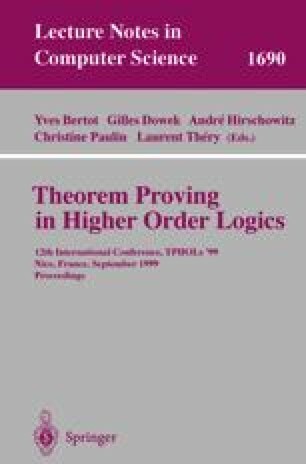 Compared to existing declarative theorem proving systems, Isar avoids several shortcomings: it is based on a few basic principles only, it is quite independent of the underlying logic, and supports a broad range of automated proof methods. Interactive proof development is supported as well. Most of the Isar concepts have already been implemented within Isabelle. The resulting system already accommodates simple applications. Research supported by DFG grant Ni 491/2-1. K. Arkoudas. Deduction vis-a-vis computation: The need for a formal language for proof engineering. The MIT Express project, http://www.ai.mit.edu/projects/express/, June 1998.